Our swing gate services are already well known in Santa Clarita. 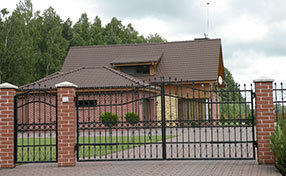 While many residents still stick to this traditional gate type for its elegant way of operating and for the image it conveys to the property, other people are more eager about the sliding type. Our sliding gate Santa Clarita service is gaining popularity fast. This model is one that requires no extra space to function, because when the gate is opening and closing it just slides from one side to another, thus being very helpful especially when there is not enough room around. the slide ones are the common choice for industrial or commercial locations. 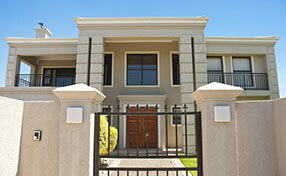 We have installed many of these and we offer solid sliding gates in every size and for any kind of place. These will withstand frequent usage conditions and weather. If they turn out to be damaged with time, or if you have a system installed long ago and it shows signs of old age, we can come over and fix it. Issues with these mechanisms may lie in any of the parts involved. Often we have to deal with sliding gate wheels which don't function properly because of poorly chosen materials. Soft wheels don't go well with a heavy gate material, its weight is crushing them and thus preventing normal movement. In such cases we replace the wheels with stronger ones, so they can support the weight above them. Excessive weight also causes rollers to change shape and bend. You can get help with that, too. We have fixed sliding gate rollers with great results and our clients are very pleased with the service. In an automatic door, there are more than these parts to suffer damage, and the damage does not always come from mechanical causes. Electrical troubles are very annoying and often cause complete breakdown of the system. 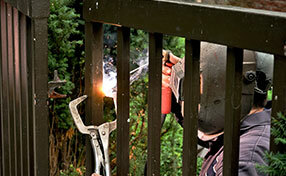 Sliding gate operator repair is another service we offer for operators that have stopped working. Even if you can't be sure where exactly to locate the problem, we know it can be the operator itself and this is why it is best to call us before you do anything by yourself; we will perform troubleshooting and fix just what needs to be fixed. Chains are easy to get damaged, especially when their quality wasn't of top level, to start with. Frequent usage, though, can cause damage even to some of the best chains out there. When this happens, we proceed to sliding gate chain replacement. Is you system rather new and looks flawless, yet for some strange reason it doesn't work properly? The trouble may lie in the sensors. If this is the case, we provide you with a new sliding gate safety sensor which will respond well to signals. As you can see, there is a multitude of services offered at our sliding gate Santa Clarita company. We are familiar with any door type, size and material, and we work with the best brands on the market. This doesn't make our services expensive, though. 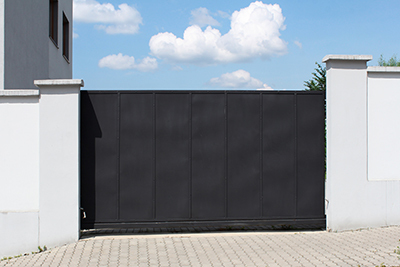 Call us today if you face problems with your installed gate or if you plan to get a brand one anytime soon. We are a licensed contractor and you may see the results of our work around the city.